Senior home equity levels continued to climb in the final quarter of 2017, ballooning to $6.6 trillion. Homeowners aged 62 and older saw their home equity rise by $149 billion between the third and fourth quarters of last year, according to the most recent Reverse Mortgage Market Index (RMMI) report. The index, calculated by the National Reverse Mortgage Lenders Association and the Arlington, Va.-based analytics firm RiskSpan, also reached a record high of 238.11 in the final three months of 2017. RiskSpan calculates the index by comparing the increase in home values and the changes in mortgage debt held by seniors aged 62 and older. In the fourth quarter, home values among that cohort rose by $163 billion, or 2.0%, in RiskSpan’s assessment, while mortgage debt increased by 0.9% or $13.4 billion. The RMMI is benchmarked against a baseline value from 2000, the first year the index was calculated. The 2017 year-end figure represents an 8.3% year-over-year boost in the index itself, compared to an 8.0% rise in 2016 and an 8.5% gain in 2015. 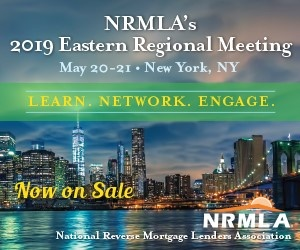 NRMLA and RiskSpan’s results also generally track with recent data from other sources: Real estate research firm CoreLogic, for instance, recently pegged the overall home equity gain for U.S. homeowners at $908 billion last year. In addition, a survey from mortgage consultancy American Financing last year found that 44% of homeowners aged 60 to 70 planned to keep holding a mortgage into retirement, while 16% said they might never pay it off. That survey also found that 19% of respondents weren’t sure what a reverse mortgage was. “Ultimately, reverse mortgages can present a viable option to help eligible individuals with limited income use the accumulated wealth in their homes to cover basic monthly living expenses, ensuring that their savings will last longer into retirement,” American Financing noted.